At Entrecote, you will find more than just 'French pub grub' with a menu ranging from steak and salad, lamb curry with rice and good old chicken and chips for the family. Entrecote is open on week days for lunch and dinner and weekends dinner only. Every day you will find wonderful daily specials created by chefs who care about both the freshness of their food as well as the presentation. 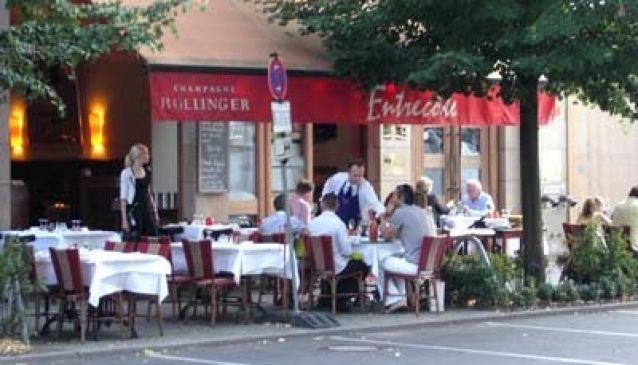 Centrally located on Schutzenstrasse 5 in the district of Mitte just a stones throw from the picturesque Gendarmenmarkt, at Entrecote you will enjoy a truly special European culinary experience in the heart of Berlin. Prices vary depending on the dish, with beef fillet at around €34, but don't be scared because they also have a dish of the day for around €12.